Treen is arguably the most difficult area of collecting to explain to an outsider. In my mind the reason is because it is one of the most subtle and sophisticated areas of collecting. Slight variations in curvature and detailing of turning make the difference between a masterpiece and mediocrity. The right patina can make a collector drool and the wrong patina can evoke a shudder. As long time treen collectors ourselves, we at The Best Things are sensitive to these issues. You will never see a piece here on which patina has been ruined by overcleaning or otherwise. In short, if a piece of treen is not special in some way, it is not on this page. Just being old and made of wood does not make it great treen. This is a lovely burl elm snuff box that has been formed from a single piece of burl and lined with tortoise shell. I don't approve in any way of using animal parts like this today, but this piece is around 200 years old. The lid is of course a second peice of wood. There is a piece of mother of pearl set into the wood. It measures 4 by 1 3/4" and is 1" high. It is as found, totally untouched with a lovely surface and color. There is one old crack in the hinge that hurts nothing and is just part of its history. This is a much nicer example than your average burl snuff box. Mangleboards were a traditional wedding gift from the groom. Ostensibly for smoothing out the bed, they were much more of a symbolic gift from a man to his new wife. They are all very individualistic and can be, like this one, superb examples of folk art in their own right. This one is dated 1787 and features a carved flower and a pineapple, as well as other carving. The entire perimeter is molded with more complexity than other examples which I have seen. The handle does not appear to represent any particular figure. About 25 1/2" overall. Wonderful as found condition. The top has a crusty old finish, more worn on the handle. The only tiny complaint that I could make is that there is a small hang hole drilled in one end for display purposes. The bottom has no finish and just a nice patina. From my personal collection. This is one of the nicest examples that I have seen. This is a decoratively turned mortar and pestle which are original to each other. The mortar is turned from burl wood, I think birch. It stands 7" high not counting the pestle, which is 7 1/2" on its own. Totally as found with nice patina, much original finish, and a great look. I am not sure of the date but presumably 19th Century. There is a chip in the mushroom head of the pestle, but that is the only damage and this is an old loss that I don't think really detracts from a great piece. If a piece is too perfect, it was either never used or is not what it pretends to be. This is a carved scoop or ladle. I think that it is cherry but I am really not sure. It does not have a dark patina, the result of frequent use and scrubbing. It shows signs of being well used but cared for. It is a nice decorative piece, probably 19th Century. Measures 8" overall and the bown is 4 1/2" wide. 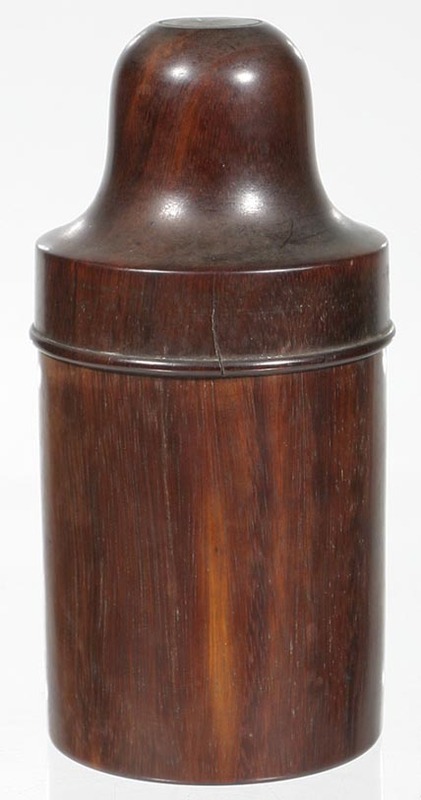 This is a bottle holder of the type that is commonly seen in boxwood, but with two very distinct differences. First, the obvious, it is coramandel, not boxwood. Second, and slightly more subtle, is that the bottle is not round. That's right, a rectangular bottle is fitted into the interior. It does not come out and I don't think that it is intentended to. It has its original stopper, which is stuck in the bottle and I don't want to force it. It stands 6" high including the top. Probably English, mid-19th Century to possible very early 20th Century. Very nice as found condition. There is just an ever so slight shrinkage check on the top starting at the beaded edge and coming up just over 1/2". Tight and of no significance. You might want to wax it, or leave it in this wonderful untouched state. This is turning from an ornamental lathe. This was a popular pastime of wealthy people who wanted to do woodworking in the 19th Century and even before. It was respectible, and the lathes to do it, were very expensive. This container has a needle in it now but its function was certainly secondary to its form. It is boxwood and has great color and patina. It stands 4 5/8" high and is covered with various forms of ornamental turning. Probably English and certainly 19th Century. Very nice as found condition. This is a birch scoop with as nice a patination as one could desire. The patina shows exactly how it was held and used. The entire tool is marvelously formed and is an exemplary example of its type. It measures just over 10 inches overall and the bowl is 4 inches long. Found in Sweden and almost certainly of Swedish origin. This type of tool is notoriously hard to date but I would venture that it is certainly first half of the 19th Century, if not late 18th Century. The nicest example that we have seen. This is a scarce boxwood pounce pot (cuttle fish bone sander). This pounce put was recently found in a New England house where it appears to have resided since it was new. It has never been touched by a dealer or collector and has much of the original lacquer finish remaining and a wonderful boxwood patina. There are not too many virgin finds like this left. There is a a small shrinkage check in the base, that can be clearly seen in the photos. The baize cloth is gone from the base. Turned from a single piece of boxwood, it is 3 1/4" high and 3 1/4" diameter at the top. A rare find in this condition. This is one of the nicest treen string dispensers that I have ever seen. We found it in Karlskrona Sweden and it is marked, in Swedish of course, "Given by my father on my 12 Birthday". Alas there is no hint of then that was or to whom it was given. Certainly it is 19th Century but it is hard to say more precisely. There are two Clark thread anchor trademark decails on the inside that were more than likely put in by the owner. I am not sure of the wood as it has been been carefully stained, with ebonized trim, on the exterior. The hand carved interior and the weight hints that it might be Linden. There is an ivory bushing around the thread hole. It stands 7" high with great from and color. Now for the bad news. The top was dropped at some point and broken in half right through the middle. It has been poorly glued and needs to be separated and reglued by and expert. Even like it is this is a great looking piece. G++ Condition except as noted. This is a decorative English Victorian boxwood container with a mother of pearl disc in the center of the threaded lid. There is what appears to be the residue of talcum powder in the container. I have seen a few of these containers, all of the same form, and all of them in England, which is the primary basis for the English attribution. Also, the original price of 1/6 is written in ink on the base. Stands 3" high and 2 3/4 diameter. Both the base and the lid of a tight shrinkage crack. As found condition with nice color and most of the original French polish finish. This is a very decorative English boxwood shotshell reloader. Appears to have seen a reasonable amount of use but is well cared for and in nice as found condition with nice color and some of the original French polish finish. Three piece construction. Marked "12", presumably for 12 gauge shells. Stands 6" high. This is a nice boxwood dice shaker. This form of dice shaker was manufactured for many decades and some of them appear to be quite late. This one is not a one of the late ones and is particularly nicely turned from an interesting piece of boxwood. It has nice color and patina from years of use. A great example of a relatively common form. This is a finely carved needle case with wonderful patina and form. The carving is a modified form of chip carving that gives the surface a very interesting three dimensional look. The wood is maple. Could be either American or British. Really a nice piece. The fit is a bit loose, but only from years of honest use. Obviously a much loved piece. This is an English treen string holder in the form of a barrel or keg, on a turned pedestal. It is made from boxwood throughout and has a nice honey brown patina. It is in nice as found condition. There are two small shrinkage cracks in the base and some dings in one spot. The removeable end has a larger shrinkage check. This is not surprising in boxwood and is just part of the piece now. 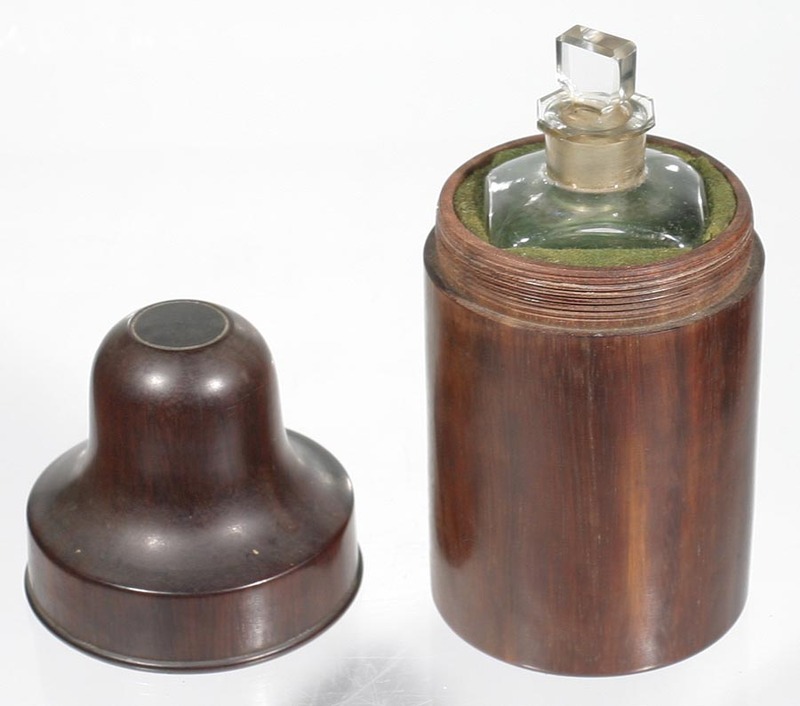 This is an English boxwood container with a glass insert that would have contained creams and ointments. The lid has a cork gasket inside. The top is marked H. Gilbertson & Sons, London, a first quality maker of boxwood bottle containers. The boxwood that this container was made from has some very nice fancy grain. It is becoming hard to find the bottle containers still with the original bottle, but this type of container is much more scarce. There is one shrinkage crack in the base A nice example.